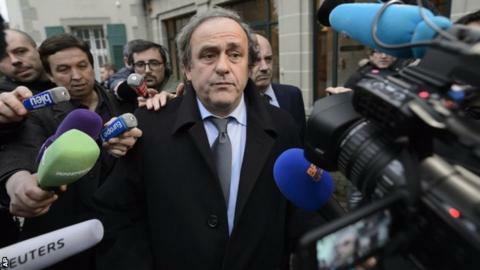 Michel Platini's appeal against his eight-year ban from all football-related activity will be heard by Fifa's appeals committee on Monday. The suspended Uefa president, 60, was banned by the world governing body's ethics committee in December, along with its president Sepp Blatter. Blatter's appeal against his own ban is due to be heard on Tuesday. The former France international and the Swiss have both denied any wrongdoing. Platini was also fined £54,000 ($80,000) after being found guilty of breaching Fifa's code of ethics. Both Platini and Blatter said the payment was made following a verbal agreement between the pair when the Frenchman worked for Blatter from 1998 to 2002, though it was not paid until nine years later. The Fifa appeals committee, which is chaired by president of the Bermuda Football Association Larry Mussenden, has the power to reduce, increase or overturn the ban. The ethics committee's investigatory chamber has confirmed it is appealing against the sanctions imposed on Platini and Blatter on the grounds that they are too lenient. Platini had at one stage been favourite to succeed Blatter as Fifa president, but the opening of ethics proceedings against him and subsequent ban ended any chance of that happening. Fifa's presidential election is due to take place on 26 February. On Friday, the committee banned the governing body's former secretary general Jerome Valcke for 12 years for multiple breaches of the code of ethics.